Bradford Marine Yacht Sales sends news of a further $545,0000 price cut on Whit Kirtland's central listing for sale, the 36.6m motor yacht Lady Diane II. Lady Diane II has a composite hull by Westport and was completed by Canada’s Sovereign yard in 1998 to a design by Jack Sarin. Refitted in 2010, she has accommodation for six guests in three staterooms. The full beam master suite has a king size bed and a full en suite with a tub and shower while two double staterooms have queen size beds with ensuite bathroom facilities. The large saloon has a wet bar and extensive entertainment system and there is WiFi internet access throughout. Extensive deck areas include an aft deck with ample seating and welcoming al fresco dining at two tables while the upper deck features another bar, seating areas, sunpads and a Jacuzzi tub. Twin 1800hp MTU engines give Lady Diane II a cruising speed of 16 knots and top speed of 18 knots. 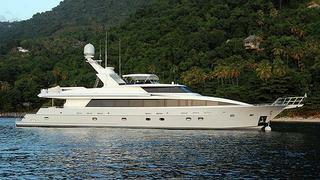 Lady Diane II is down from $3,995,000 to $3,450,000.